London street artist CityZenKane’s has added a new video to his arsenal. His ray gun video shows the making of his 3D street sculptures. CZK sculpts the basic form in polymer, casts it and then paints it or covers it with cane slices. He also works with polymer UV and neon effects on his street art. These additional articles and photos (here, here and here) may give you a better perspective on CZK’s work. The link is from Italy’s Leila Bidler. I’ve been so wrapped up in vacationing and spring that I’ve neglected some of the edgier, more interesting developments in our community. Here are some of the recent polymer-related books you may find of interest as well. European Clay Art is a 100-page catalog of the work of 45 artists in 16 countries. Perfectly Paired, Patricia Kimle’s exploration of ways to cleverly combine polymer and metal clays. Jewelry Inspirations, Sherry Haab’s latest show and tell about trendy, delightful jewelry designs from a wide range of materials. 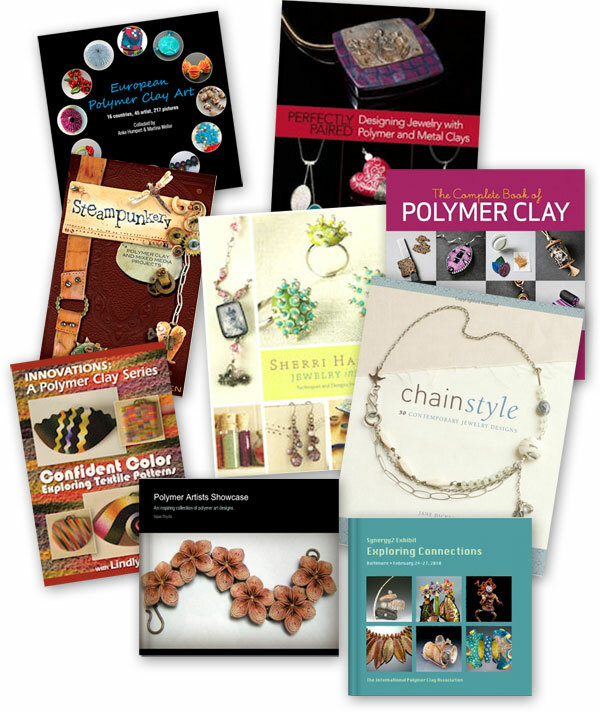 Lisa Pavelka’s Complete Book of Polymer Clay, 244 pages of techniques and applications. Polymer Artists Showcase, a great collection of polymer designs from Tejae Floyde. You can thumb through it online. Synergy2 Exhibit Catalog, an 80-page memento of this year’s IPCA conference featuring work from artists worldwide. My current favorite non-polymer book is ChainStyle by Jane Dickerson. It’s a great reference for those of us who tend to be too matchy-matchy. Thanks for the book list. I’m excited to buy Lindly’s color DVDs. I just bought ChainStyle and agree that it is very inspirational! I just bought a great book by Patricia Kimle that pairs polymer clay with precious metal clay. It’s a lot of fun to read. It’s called Perfectly Paired. Check it out! She’s got some gorgeous projects! Just a bit confused here. Is this or is this not THE City Zen Cane, aka Ford and Forlano, aka the Original Polymer Gods 😉 ? This CityZenCane seems to be someone different. Those pots of metallic colour he’s using in the video. They don’t look to be powder, they appear to be paint. Does anyone know what they might be? Some of the other books have just arrived on my desk and I cant wait to dig into them…;-) Great list! Thanks to you and Leila for this post. I was unaware there was another artist called cityzenkane, so appologies for the confusion. I have also shortened my name to CZK. Hope that clears things up. Keep up the great work…. Also does anyone know of any workshops in North London, my canes are very crude and I would like to improve them.